You're after a sleek, all-in-one desktop machine with a huge, dazzling display - so do you opt for the brand new model just launched by Microsoft or the classic Apple product that's been keeping punters happy for several years now? We're here to help you decide. While the iMac may have been out much longer than the Surface Studio, its most recent upgrade came just a year ago, with the updated Retina screen 21.5-inch model. Here we'll compare the most recent two models with Microsoft's newly unveiled all-in-one.You're after a sleek, all-in-one desktop machine with a huge, dazzling display - so do you opt for the brand new model just launched by Microsoft or the classic Apple product that's been keeping punters happy for several years now? We're here to help you decide. While the iMac may have been out much longer than the Surface Studio, its most recent upgrade came just a year ago, with the updated Retina screen 21.5-inch model. Here we'll compare the most recent two models with Microsoft's newly unveiled all-in-one. These are two seriously good-looking bits of kit - whether you're a diehard Apple fan or a committed Microsoft loyalist, you have to admit that they both know how to design an all-in-one computer. On both the Surface Studio and the iMac, the screens stand out - you get a 28-inch, 4,500 x 3,000 pixel display on Microsoft's machine, and a choice of either a 21.5-inch, 4,096 x 2,304 pixel screen or a 27-inch, 5,120 x 2,880 pixel screen if you take the Apple route. While Apple's iMacs are made from one piece of slim aluminium, Microsoft has taken a less conventional approach with the Surface Studio, putting the main guts of the computer in the base unit underneath the screen. That of course means the screen can be thinner - just 12.5mm thick across the whole panel. The Surface Studio also has another couple of tricks up its sleeve: the ability to fold down and turn into a huge, almost-flat digital canvas for you to draw on, and the touchscreen display, that means you can interact with it directly. Both the Surface Studio and iMac can be picked up with a choice of internal specs, depending on the power you need and how much you want to spend. At the time of writing you can pick up a Surface Studio with an Intel Core i5 or i7 processor, plus 8GB, 16GB or 32GB of RAM. There are three Nvidia graphics chipsets to choose from, and either a 1TB or 2TB hard drive. As for the iMac, the lowest spec 21.5-inch model is an Intel Core i5 processor running at 1.6GHz, with 8GB of RAM, a 1TB hard drive, and integrated Intel HD graphics. At the very top level, there's the 27-inch model with a 3.3GHz i5 CPU, a maximum of 32GB of RAM, a 2TB hard drive and an AMD Radeon graphics chipset. In other words, the specs on offer are broadly comparable - even at the top end, these aren't VR-ready gaming machines, but they will cope with some intensive video and photo editing if you max out the components. 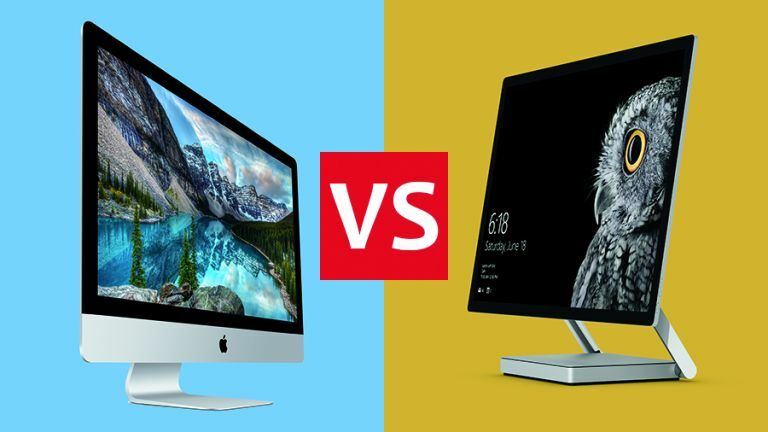 Considering we're comparing two pieces of hardware here, software plays a surprisingly major role - in fact if you're choosing which of these computers to buy, you could base your whole decision on whether you prefer Windows 10 or macOS Sierra. Both these operating systems have matured to such a point that they're really both as good as each other now. Choosing macOS Sierra gives you access to Apple's suite of programs, like Final Cut Pro and Pages, but in terms of core OS functionality there's not much to choose between them - they even both have a voice-activated assistant, in the form of Siri or Cortana. You'll probably want to opt for the operating system you're most familiar with, but both Microsoft and Apple's packages are intuitive and accessible enough to welcome beginners as well, so you're not really going to miss out by going for one option or the other. The only area where Windows is still clearly in the lead is in terms of gaming - even if the Surface Studio isn't much of a games machine, if you think you're going to want to be playing some games every now and again, Windows 10 is the option to go for. Finally, price, and whichever computer you opt for you're going to have to spend a while saving. You can pre-order a Surface Studio from Microsoft now for $2,999 (roughly £2,375) to be delivered in "early 2017". With the specs bumped up to the max you're looking at $4,199 (about £3,335). A Retina 4K iMac starts at £1,449 or $1,499, with the 5K version beginning at £1,749 or $1,799. The top-spec 5K iMac costs £2,249 or $2,299, but you can max that out with upgrades to £3,908 or $4,128 if you want extra graphics or hard drive space. Right now there's much more flexibility with the iMac pricing, and if you're on a tight budget then even the entry level Surface Studio is out of your grasp - and of course it's not going to turn up until sometime next year. There's no way to pick an outright winner - it depends on your taste in style, your love (or otherwise) of touchscreens, and which OS you prefer as to which one's best for you - but we're just grateful that there are too such impressive machines on sale. Surface Go vs Surface Pro 6: which 2-in-1 is best for you? What has Microsoft got planned for the Surface Go 2? Does the Surface Pro 6 or Surface Laptop 2 have what it takes? What might Microsoft be planning?